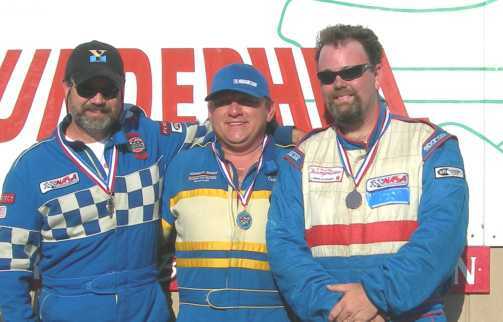 Shed Racing, with sponsorship from BiggsB Enterprises returned to Thunderhill Raceway Park, August 11-13 2006, with their first two car effort. 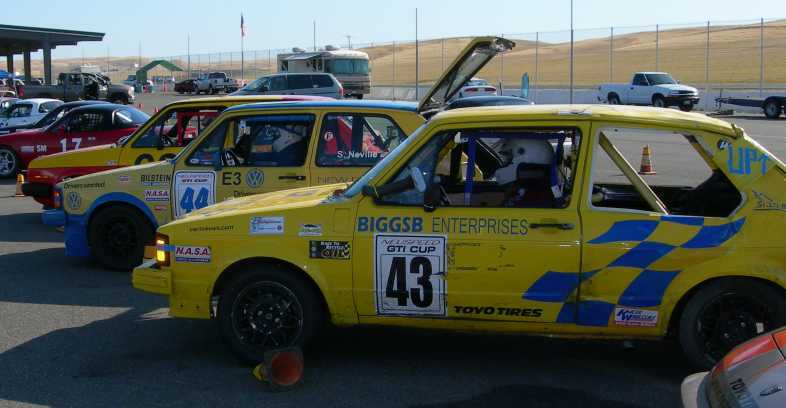 The campaign for the final NASA's GTI Cup class was still tight, with Team Shed only 5 points behind series leader Scott Neville entering this event. There were only 3 cars in class for the event, with Carlos Suarez rounding out the field. They were also campaigning the BiggsB Enterprises Subaru Impreza WRX STI in the Time Trial 2 class. Car owner Bluegrass Biggs is developing the Subaru as a race car for next season, and needed to get the car on track to gather data from the engine management system to fine tune the engine under race track conditions. NASA added an extra test day for this event, with 3 additional practice sessions for all race groups on Friday, with the normal practice, qualifying and race groups on Saturday and Sunday. Tom and Ron would share the car on Friday, With Ron racing the #43 GTI on Saturday while Tom worked out the Subaru. The driving duties would be reversed on Sunday. Ron's daughter Catherine and son Jason came along for the entire event to help out. The team arrived at the track Thursday afternoon, with the busy schedule for the weekend, paddock space would be at a premium, and they wanted to make sure they could reserve enough space for the whole group. Scott Neville also arrived Thursday. Bluegrass arrived Friday afternoon with the Subaru, followed by Scott Miller late Friday evening, and Carlos Suarez and Marcus Miller Saturday morning. There were some changes to the engines for the cars for this weekend, with Tom and Ron installing a new Techtonics Tuning 280/276 camshaft. The cracked header from the last event was found to be beyond repair, so the old factory VW cast iron exhaust manifold was installed, along with a used Techtonics down pipe sourced from ebay. Scott Neville also changed cams for this event, with Scott trying a DC270 from Dougherty Racing Cams. Tom suited up for the first session of the morning, and lined up behind Scott Neville on the grid. Tom and Scott both took it easy for the first part of the session, playing follow the leader, and swapping the lead back and forth as each driver got a feel for their improved engines. Tom was fastest in the morning session, with a 2:14.9, followed by Scott with a 2:15.8. Jason checked the tire pressures prior to the morning session, and noticed that the right front tire had lost a couple pounds over night. Ron and Tom decided it was probably just a slow leak, and decided to run the tire for the morning session and check the pressure after the session to see if it was leaking. The pressure was normal when the car came off track. The next session on the schedule was the first of two 40 minute practice sessions Ron suited up and went out, this was his first time in the car with the rear suspension changes from last race weekend, plus the 13" wheels in the front allowing more camber adjustment. He went out to get the feel for the car, and was fast fairly quickly, turning a 2:16.5 on his first flying lap. His times slipped a bit, enough that he came in to the paddock on the sixth lap, complaining that he wasn't happy with the tires, wanting to switch back to the 14" stock VW wheels he was used to. A brief discussion with Tom, and a quick inspection of the front tires didn't show anything obviously wrong (although the tire pressure was not checked, in hindsight this was a critical oversight). The right front camber would have to be adjusted to allow the stock wheels to fit without rubbing made the time needed for the change too long to do in the middle of the session, Ron decided to go back out on track and see how things went. Things didn't go well. In retrospect, it would appear that the right front tire was losing air, but this was not evident until Ron turned in to turn one on his first flying lap. Turn one is a very fast sweeping left turn, and is the fastest corner on the track. 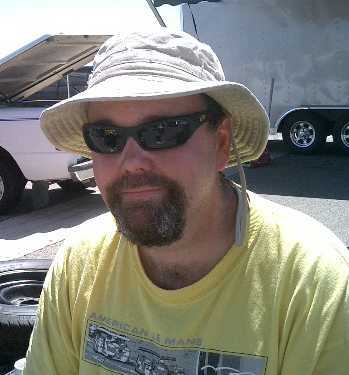 When Ron turned in, the reduced grip of the highly loaded, right front tire made the car understeer, causing Ron to miss the apex of the corner by a couple feet. The car continued through the corner, with the right front tire rolled over on the rim and howling, it continued to understeer, pushing toward the exit berm. When Ron reached the exit berm, the right side tires dropped off the pavement and into the dirt. The VW Rabbit GTI, being a front engine, front wheel drive car has a huge front weight bias, which means in fast corners the inside rear wheel is very lightly loaded and is frequently off the ground. When the right side tires dropped into the dirt, the car was still heavily loaded to the right side, meaning the only rear tire with any grip was now on a surface that had none, the back end came around, and the car spun across the track. Ron put the brake pedal to the floor, and was along for the ride. The car slid sideways diagonally across the track, sliding into the dirt on the left of the track, and continued to rotate to the left. After sliding for some distance, the right side wheels dug in and the car rolled. Luckily the car had shed a lot of speed by this time, and the car only rolled once, apparently twisting as it rolled, and landed on it's wheels pointing back at the track. Is the sky supposed to be on the left? When the dust cleared, Ron dropped the window net to show the track workers he was OK, and climbed out to assess the damage. He was out of the car and had traded his helmet for a ball cap by the time the emergency crew arrived on the scene. The crash crew checked out Ron, and towed the car back to the paddock. Amazingly, the damage wasn't that bad. 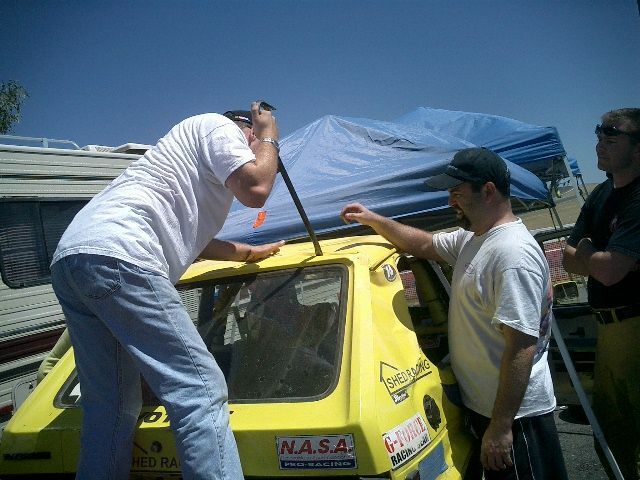 The roof was pushed down at the rear edge and the hatchback wouldn't open, but the roof didn't bend far enough forward to touch the roll cage. The rear side windows popped out without breaking, complete with the weatherstrip. The rear window was intact. Upon further examination, the rear suspension was damaged, with the trailing arm on the right side tweaked pretty bad, and the front alignment needed attention. The front air dam also took a significant hit, and was close to falling off the car. Ron and Tom were standing around trying to figure out what to do next assuming their weekend was done, when Pro-7 & Spec Miata driver Ken Kurtz came by to check on Ron. He looked at the car for about 30 seconds before proclaiming "You can fix that". Ken took charge for the next hour, dispatching Scott Neville to the track maintenance shed to source a length of 4x4 lumber. 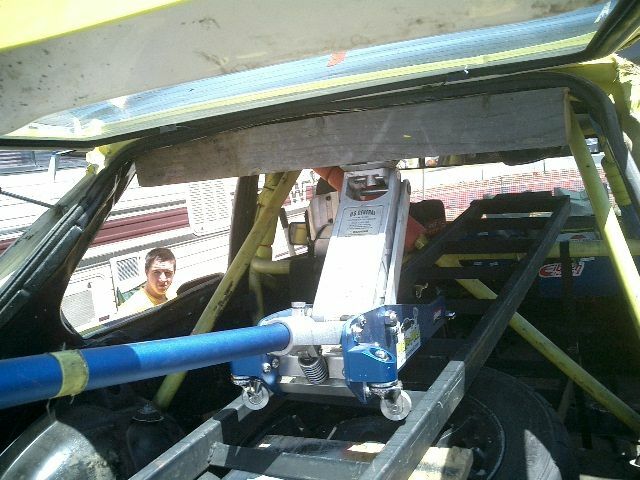 With the help of Ken and Scott Neville, Tom and Ron pried the rear hatch open, and went to work with Scott's floor jack and the 4x4, hammers, pry bars, and even the ramps from the trailers, and had roof back into a semblance of it's proper shape. The rear window was removed, and the hatchback was secured in place with duct tape and hose clamps. Scott Neville repaired the front valance and made it better than it was before the accident. An examination of the rear suspension showed one end of the axle beam bent, giving the right rear tire significant toe out. A brief attempt to bend it back using trailer tie-downs and a come-along didn't work as well as hoped, so Scott Neville got on the phone to try and track down a replacement rear suspension piece. He called Carlos, who had a spare in his shop, and he agreed to bring it with him when he came to the track the next morning. The team removed the damaged part, and had it ready to swap the part when Carlos made it to the track. There would be no way to make the morning session, but there would be plenty of time to have the car ready to make the qualifying session at noon. Scott and Robert from Miller Motorsports arrived in the late afternoon, and set up next to us in the paddock. The Sun rose Saturday morning over a very busy paddock. Bluegrass was scrambling to finish the prep of the Subaru for it's track debut, Ron with help from Robert Miller continued to work on the rear of the GTI, while Scott and Marcus Miller (who arrived early Saturday morning) worked on the Miller Motorsports Pro-7 to get it ready for the track. Tom and Bluegrass hurried down to the HPDE/Time Trial driver's meeting, and to track down the TT director to pick up a rental transponder. All that was left to do to get the Subaru ready for the first session was to install the transponder, secure the laptop computer used for data logging, and fuel the car. The monster turbocharged engine of the Subaru has a voracious appetite for 100 octane race fuel. Unfortunately the morning meeting ran long, and there was not enough time to do the last few items so Tom missed the first Time Trial session of the day. Scott Neville was fastest in the morning warmup, turning a 2:16.4, followed by Carlos with a 2:18.9. Ron with help from Jason, and Robert and Scott Miller finished swapping out the rear suspension, and doing a rough alignment on the car, and took it for a spin around the paddock. 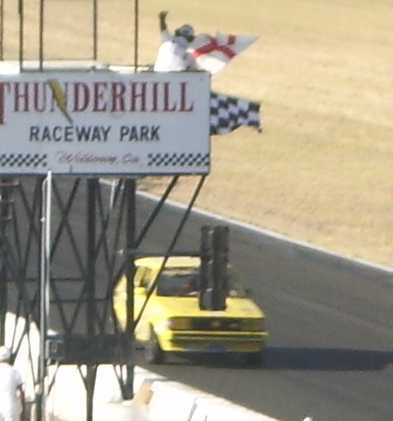 He was able to do a few high speed blasts on the track access road, plus some figure-eights in the outer parking lot, and decided the car seemed to be fixed. With approval from the NASA tech inspectors, the team had the OK to take the car out on track in the qualifying session. 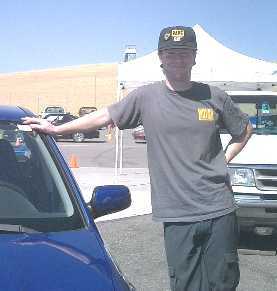 The next item on the schedule was the Time Trial group, and Tom took the blue BiggsB Subaru out on the track for the first time. He spent the session introducing himself to the car, getting a feel for the shifter, steering and suspension, and of course, the amazing power. Bluegrass has built himself a very capable car. Without trying very hard, Tom was able to turn a 2:16.8 on street tires. Bluegrass retrieved the laptop from the Subaru after the session and retired to the RV to examine the data logs. Ron took the #43 GTI out for the qualifying session for a few very tentative laps, to make sure it was safe to race. Regardless of how good the car felt in the paddock, it is no comparison to actually taking the car out on track. 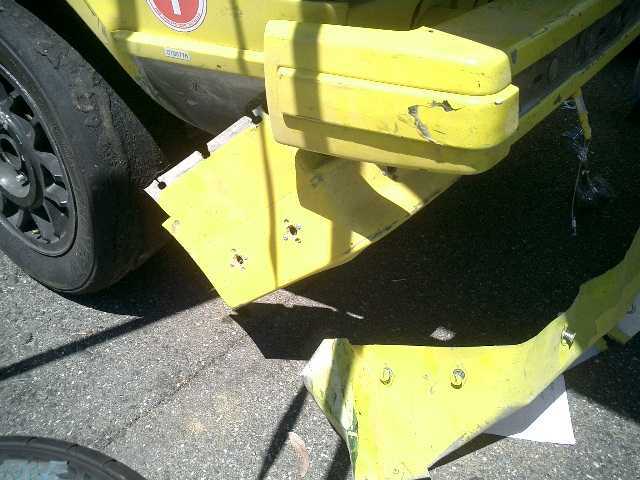 He only ran 2 laps, before returning to the paddock complaining of a bad vibration in the right front. A quick conference determined that the right front wheel was the probable cause, and the wheel was replaced for the evening race. Carlos was fastest in qualifying, earning the GTI pole with a 2:14.8, followed by Scott Neville with a 2:16.6, and Ron with a 2:40.2. The car had an audible vacuum leak, but it didn't seem to be hurting anything, so it was left alone for the time being. Tom took the Subaru out for the next time trial session, and his times improved with his growing familiarity and comfort with the car. 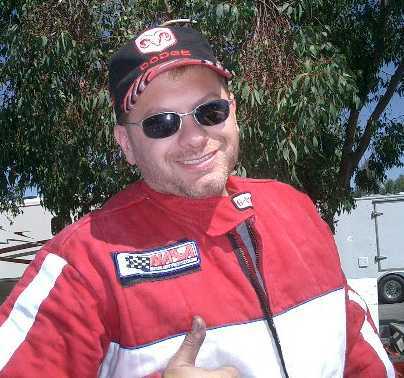 He turned several laps under 2:15, with his best a 2:13.8, his fastest lap ever at Thunderhill. After the session, Bluegrass again examined the data logs, and went to work modifying the engine map to try something a little different for the final Time Trial session. With the new engine management map loaded Tom took the Subaru out for the last Time Trial session. On the first flying lap, he thought the engine felt funny, it seemed to be down on power, and the power dropping the more he pushed it. Not wanting to damage the engine, he returned to the pits, where Bluegrass quickly reloaded the old engine map. Tom hurried back on track to finish the session, but only got one more lap in before the time ran out. His best lap was a 2:17.4, turned on his out lap after his pit stop. The engine returned to normal after the engine map was reloaded. Ron suited up for the last event of the day, the group A race. He was still uncertain of the condition of the car, after running only one hot lap in qualifying, so he planned to take it easy and make sure the car was safe. Ron got a great start and tucked in behind Carlos into the first turn, when Scott Neville got a good run around the outside taking over second place. Ron was understandably apprehensive about turn one, rolling a car will do that to you. The running order was decided at the first turn, with Carlos opening his lead over Scott, who stretched the gap in front of Ron. The race was uneventful until a Porsche 944 suffered a massive engine failure in turn 4. He was able to get off the track to the outside, but not before dumping all of his oil on the racing surface. Several cars spun from the oil slick on the track. Carlos turned the fastest lap of the race with a 2:15.1, followed by Scott with a 2:15.9 and Ron with a 2:19.7. Considering the events of the previous day, this can be considered a huge victory for Ron and the whole Shed Racing team. Ron was first on track Sunday morning, taking his turn in the Subaru for the first time trial session. He took the first session the same as Tom did, nice and easy to get acquainted with the car. The all wheel drive, power steering, 1000 lbs more weight, less grippy tires make it a much different car to drive than the GTI, even if it didn't have four times the horsepower. Ron's best lap for the early morning session was a 2:21.7. Tom swapped back to the 13" BMW wheels for the morning warmup, taking advantage of the wheel offset to max out the front camber. Jason fueled the car, and Tom geared up and headed to grid early. The morning warmup was scheduled for 10 minutes, and was combined with race group "C", making for a short session with a lot of traffic. Tom got the feel for the car on the out lap, and knowing that he would be lucky to get 2 flying laps, hammered the car as soon as he could. He was rewarded with the fastest time in the morning session, a 2:17.6. Scott Neville was second fastest with a 2:18.3, followed by Carlos with a 2:18.7. The car seemed to be running good, and while it didn't handle as good as it did before Ron's shunt, it was still quick. Ron was next on track for the second Time Trail session of the day. He had problems right away, when on the front straight on his first flying lap, one of the intercooler hoses came loose under boost pressure. The Subaru engine sensed something was very wrong, and shut itself off to prevent damage. Ron gets acquainted with the crash crew. Again. Ron didn't immediately know what the problem was, so he got off the racing line, and coasted to a stop outside turn two. The Tow crew was dispatched, only to discover that the Subaru didn't have an easily accessible tow hook, and that they couldn't tow it by the front wheels as the center differential had locked. 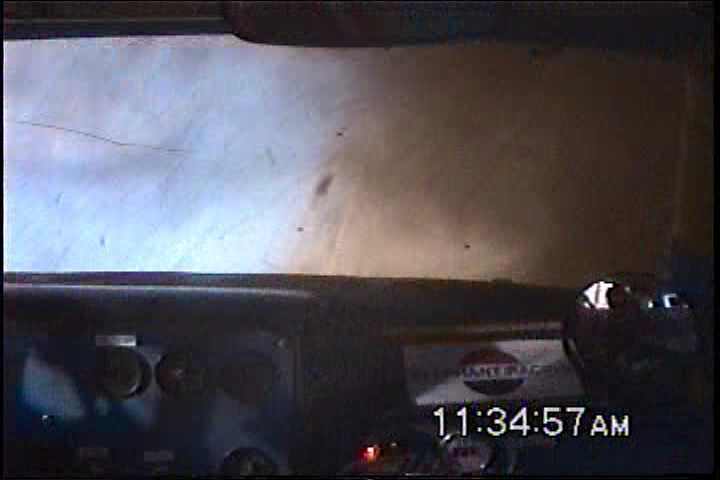 While the tow crew had the front of the car in the air, one of the workers noticed the dislodged intercooler plumbing, and asked Ron if that could cause the symptoms. 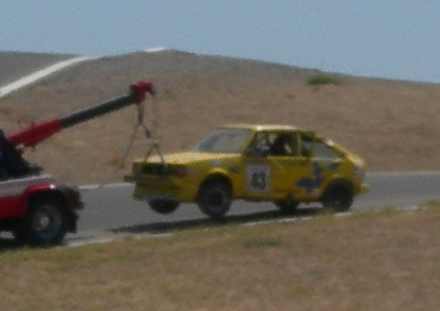 They popped the hose back into place, and Ron was able to limp the Subaru back to the paddock under it's own power. Bluegrass immediately fixed the problem, and verified all the other pipes were tight. Tom was next up for his qualifying session. He noticed right away that the engine seemed to be running OK, but was noticeably down on power. He stayed out but was only able to manage a 2:18.2. Carlos was again fastest in qualifying, with a 2:15.2, followed by Scott Neville with a 2:15.7. Tom returned to the paddock to try and diagnose the problem with the engine. It was quickly determined that in addition to the vacuum leak, the static ignition timing had advanced significantly. It is normally about 15º advanced at idle, and 34º fully advanced. After the qualifying session, the timing was close to 35º at idle, and about 55º fully advanced. How the engine ran at all is a mystery. The timing was properly adjusted, and Tom and Ron disassembled the entire intake tract to try and locate the leak. It was quickly located on the back side of the throttle body, two small vacuum plugs had split. The two plugs were replaced with a loop of vacuum hose, and the car was reassembled and seemed to be repaired. Tom searched out the Time Trial director to get permission to run a few laps in the upcoming TT session to test the car. Ron and Tom lined up for the Third Time trial session of the day, at the back of the grid. Ron wanting to just take a few laps to verify there would be no more problems with the intercooler ducting, and Tom to see if the engine was fixed. The Subaru checked out fine, and the GTI was improved, but still down on power over the morning warmup and Friday morning sessions. Ron's best time for the session was a 2:24.8. There was no time recorded for Tom. With no other repair option, and the race approaching, Tom decided to just race the car as is and see if it survived. Ron took the Subaru out for his final Time Trial session, and drove the car hard. By this time the turbo bearings were failing, and the car was starting to smoke a bit. Ron managed to turn a 2:18.177 in what was only his second full session in the car. Bluegrass built a very capable car.